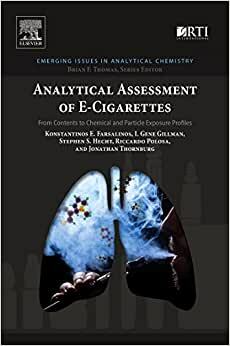 A volume in the Emerging Issues in Analytical Chemistry series, Analytical Assessment of E-Cigarettes: From Contents to Chemical and Particle Exposure Profiles addresses the many issues surrounding electronic cigarettes in an unprecedented level of scientific detail. The plethora of product devices, formulations, and flavors, combined with the lack of industry standards and labeling requirements, quality control, and limited product oversight, has given rise to public concern about initiation of use and potential for adverse exposure and negative long-term health outcomes. This volume discusses how analytical methods can address these issues and support the manufacturing, labeling, distribution, testing, regulation, and monitoring for consistency of products with known chemical content and demonstrated performance characteristics. The book begins with the background on aerosol drug delivery services and e-cigarettes, constituents of nicotine-containing liquid dosing formulations, typical use scenarios and associated aerosol emissions, and chemical exposures and pharmacological and toxicological effect profiles, and then continues with descriptions of the analytical methods used to characterize the chemicals in formulations and emissions from e-cigarettes, including their stability, physical particle-size distribution and thermal degradation under commonly employed conditions of use. Analytical methods enabling detection of biomarkers of exposure and harm in complex biological matrices are discussed, with an emphasis on constituents or emissions of current medicinal interest or with potential to produce harm. Opportunities and challenges for analytical chemistry in supporting the continued development and use of safe and consistent dosage formulations as alternatives to tobacco products are also explored, with a concluding section describing an analytical approach to a risk-benefit assessment of e-cigarette use on human health. The Emerging Issues in Analytical Chemistry series is published in partnership with RTI International and edited by Brian F. Thomas. Please be sure to check out our other featured volumes: Thomas, Brian F. and ElSohly, Mahmoud. The Analytical Chemistry of Cannabis: Quality Assessment, Assurance, and Regulation of Medicinal Marijuana and Cannabinoid Preparations, 9780128046463, December 2015. Hackney, Anthony C. Exercise, Sport, and Bioanalytical Chemistry: Principles and Practice, 9780128092064, March 2016. Tanna, Sangeeta and Lawson, Graham. Analytical Chemistry for Assessing Medication Adherence, 9780128054635, April 2016. Rao, Vikram; Knight, Rob; and Stoner, Brian. Sustainable Shale Oil and Gas: Analytical Chemistry, Biochemistry, and Geochemistry Methods, 9780128103890, September 2016. Konstantinos E. Farsalinos, M.D., is a research fellow at the Onassis Cardiac Surgery Center in Athens, Greece, and at the Department of Pharmacy, University of Patras, Greece. He has been conducting laboratory and clinical research on e-cigarettes as a principal investigator since 2011. Examples of his work include the first study on the cytotoxic effects of e-cigarette vapor on cultured cells and the immediate effects of e-cigarette use on cardiac function and coronary circulation. He ran a worldwide online survey of almost 20,000 vapers (users of e-cigarettes) identifying patterns of use and experience with e-cigarettes among consumers, published in 2014. He has presented his research findings at major international scientific congresses and his research was used in preparing the regulatory framework on e-cigarettes by the European Union. As of 2016, he has published more than 40 studies and articles in international peer-reviewed scientific journals about smoking, tobacco harm reduction, and e-cigarettes. Gene Gillman received his PhD in Chemistry from Wake Forest University, Winston-Salem, North Carolina. He is now Laboratory Director at Enthalpy Analytical, Inc., Durham, North Carolina. He has considerable experience in investigating the constituents and chemistry of tobacco smoke, and in developing and validating relevant LC, LC-MS, GC-MS, and biological based test methods. He brings experience from both the cigarette manufacturing and tobacco testing contract research organization perspectives to his work with domestic and international study groups and trade organizations. Stephen Hecht received his PhD from the Massachusetts Institute of Technology and is currently the Wallin Land Grant Professor of Cancer Prevention, Department of Laboratory Medicine and Pathology at the University of Minnesota. His research interests include mechanisms of metabolic activation and DNA modification by carcinogens in tobacco products and the human environment, and application of this knowledge to cancer prevention. His laboratory focuses on the properties of carcinogenic nitrosamines, polycyclic aromatic hydrocarbons, and aldehydes. Using state-of-the-art mass spectrometry and related techniques, he has developed analytical methods for quantitation of carcinogen and toxicant metabolites and DNA adducts in laboratory animals and in human urine, blood, and tissues. These biomarkers are applied in collaborative clinical and epidemiologic studies. Stable isotope-labelled carcinogens and their analogues are employed in tobacco users to track individual differences in metabolism. The effects of naturally occurring potentially cancer-chemopreventive compounds on carcinogen metabolism in humans are also investigated. Among his numerous distinctions, Dr. Hecht has authored or co-authored over 700 peer-reviewed research publications, is Editor-in-Chief of Chemical Research in Toxicology, and in 2014 was named an American Association for the Advancement of Science Fellow. Riccardo Polosa is the Director of the Institute for Internal Medicine and Clinical Immunology of the University of Catania, Italy. He is also in charge of the University's Centre for Tobacco Research (CPCT) and is Honorary Professor of Medicine at University of Southampton, UK. An internationally recognized leader in the field of clinical bronchoprovocation (airway-challenge studies), he has published more than 250 peer-reviewed articles and books, mainly on respiratory medicine, clinical immunology, and tobacco addiction. After many years of service as President of the Italian Anti-Smoking League (LIAF: Lega Italiana Anti Fumo), he now serves as its Chief Scientific Advisor. Jonathan Thornburg received his PhD in aerosol physics and engineering from the University of North Carolina at Chapel Hill. He is Director of Exposure and Aerosol Technology at RTI International. His research interests over several decades involve four key areas of expertise: (1) development of aerosol exposure instrumentation, (2) aerosol exposure modelling, (3) understanding the physical and chemical properties of aerosols and (4) understanding aerosol fate and transport in outdoor and indoor environments. These cornerstones are applied in laboratory and field studies to effectively research the entire exposure-dose-response paradigm. He recently led a study of e-cigarette emissions characteristics and the potential for second-hand exposure. The study found that emissions are a mixture of nanometer-size particles and vapors composed of the carrier liquid, nicotine, flavorings, and artificial colors. Respiratory deposition modelling predicted that more than half of the emissions are exhaled into the ambient air by the user, so the potential for second-hand exposure is high. The most important topic for over a billion people by the end of this century!